Seeds of “The Messiah’s Signature” were planted in the mid-late nineties The cover’s photograph was captured one Fall mid-afternoon in Seattle. Jeanette attended Shoreline college where the English professor realized her writing potential. Shortly after relocating to Texas she was invited to a Christian Writers’ group. In the early 2000’s she began a journal of words and phrases from her Pastors’ sermons. In 2015 her collection of poems and prose, was finally compiled. Supporting images consist of photographs taken during her extensive travels; watercolors, which includes one painted by her Mother, and for readers’ edification, the accompanying bible verses are complete. Jeanette’s ancestry, can be traced to the Spanish Inquisition era. The De Litra family of Portugal fled their homeland to escape its tyranny. Those, who could afford passage, sought refuge in the Americas; others sailed to the shores of Wales. (There the family name was changed to Little). She was transplanted from her homeland Wales via Australia to America in the mid-eighties. No doubt, during her global sojourns, unbeknown to her, other descendents and her pathways have intersected. Her aptitude for writing poetry was encouraged, during the nineties, by her English instructor Nancy of Shoreline Community college in Seattle, and a dear friend and professor Rose, of Seattle Pacific university. 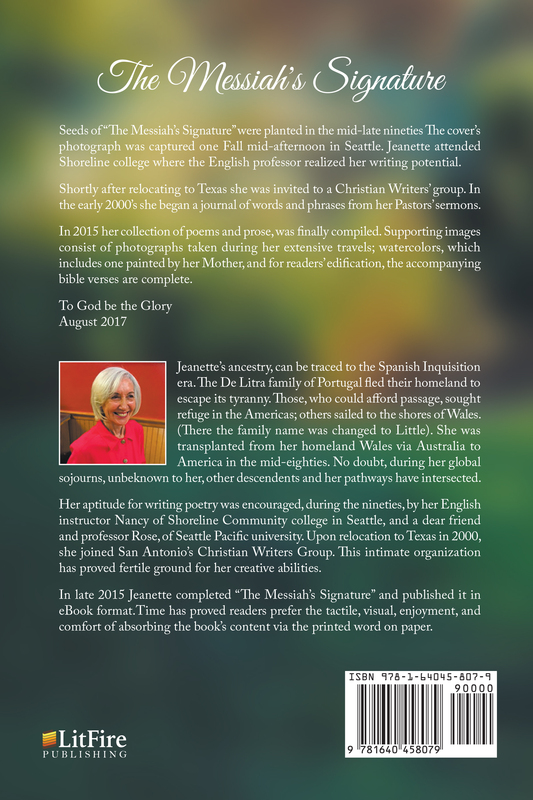 Upon relocation to Texas in 2000, she joined San Antonio’s Christian Writers Group. This intimate organization has proved fertile ground for her creative abilities. 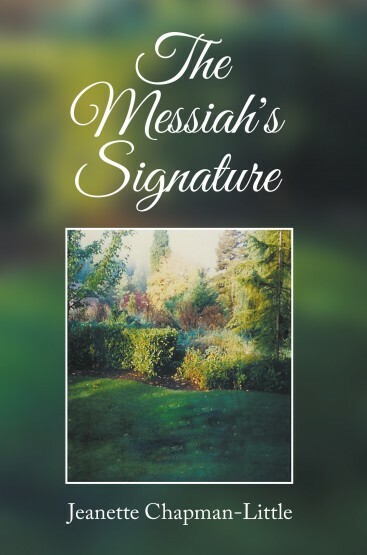 In late 2015 Jeanette completed “The Messiah’s Signature” and published it in eBook format.Time has proved readers prefer the tactile, visual, enjoyment, and comfort of absorbing the book’s content via the printed word on paper.